- Justin Gatlin explaining why he's been trash talking prior to facing Usain Bolt today in Rome. How fast could a dog run a marathon? LRC Betsy Saina Comes Through As Favorite and Wins 10k; Emma Bates Third Saina delivered as the favorite as she ran away from Aliphine Tuliamuk-Bolton on the last lap. Top American honors went to Boise Statee sophomore Emma Bates. *LRC 800 Semifinals - No huge surprised but... The heats went largely according to form although the Florida and Arkansas men took a hit and Elijah Greer made it much more interesting than it needed to be. Interviews with NCAA 800 favorites Cas Loxsom, Elijah Greer, Notoya Goule, and Laura Roesler. *LRC Men’s Steeplechase Semifinals: Anthony Rotich and Henry Lelei Win Their Heats Easily The big casualty was FSU freshmen Zak Seddon. The #2 seed didn't make the final after biting it on a water jump. AP Day 1 Recap Saina was happy getting the win saying, "I needed my happiness back. I needed my smile." Register Guard: "Unlike Oregon's Men, UO Women Hold Form In First Day Qualifying And Lay The Foundation For Title Run"
Day 1 Doesn't Go Well For OU Men As 400 Star Mike Berry (Runner-Up Last Year And This Year Indoors) Fails To Make Final They had to go down to the thousandth of a second to break the tie for the final time qualifier and Berry was .004 too slow. They also took a hit with Pac-12 champ Dakotah Keys is in only 15th place halfway through the decathlon. *OU Coach Robert Johnson Talks About Berry Not Making The Final: "One hundred percent (heartbreak). It's the ebbs and flows of a championship meet." With Berrry's projected points in the 400 off the table (he was predicted 2nd), Oregon may be hard-pressed for a top-four finish and trophy. On Berry running the 4x400 prelims today, Johnson said, "He looked me right in the eye and said he'd be ready (for the relay)." Texas' Ryan Crouser Wins NCAA Shot Put With A Clutch Throw As 5 Out Of His 6 Throws Were Fouls His 3rd throw was his only legal one, but if that had been a foul he would have been out of the competition. The only other men’s final was the pole vault where Ole Miss sophomore Sam Kendricks won with 18-8 1/4. TCU’s Lorraine Ugen Soars to an Unexpected NCAA LJ Crown With 22 Feet, 2 1/2 Inches, Tying The 14th Longest In NCAA History Arizona State senior Chelsea Cassulo won the hammer throw with 226-9 ft.
Track Season Ends For OU Football Player De’Anthony Thomas And His Teammates As The Oregon 4x100 Fails To Make The Final Another interesting fact you might know, Arizona senior 400 hurdler Georganne Moline was 5th at the 2012 Olympics. She easily advanced here with the second fastest time of the day. *MB Silmon windy 9.92, Locke 9.97 in 2013 NCAA prelims LRC interview with Lock here. The women's 100 was good too with Octavious Freeman running 10.99 to English Gardner's 11.00. Interviews here and here. Profile Of NCAA 100m favorite Isiah Young Of Ole Miss, Who Has Run 9.99 Despite Finishing Dead Last At State Meet In HS Ole Miss track coach Brian O'Neal: "I value him like an art collector would a Picasso." Oregon Woman Have Had A Sign In The Locker Room All Year That Says, "Triple Crown. Every practice counts." MB: Colorado at NCAA meet - what's up? Coming In As The Indoor National Champion And An Undefeated Outdoor Season, OU's Elijah Greer Is Full Of Confidence Ahead Of NCAA 800 Greer: "In terms of being competitive and assertive, I absolutely want to see myself as the most dangerous athlete in the field." Chris Bucknam Hoping To Win Arkansas' Second National Title Under His Reign This Week In Eugene They enter the meet ranked second behind Texas A&M. Also This Weekend In Oregon: Andrew Wheating And Matt Centrowitz Racing Portland Track Classic 800 On Saturday If you missed the previous announcements, Mary Cain will be going for the US Champs "A" Standard (15:46) in the 5k. The high school record is 15:48 while the American Jr. record is 15:43. Oscar Pistorius' Case Has "Gripped The Entire SA Nation" As They Gossip On Everything From His Guilt To His Beard Detailed article reviews some facts of the incident (if you've forgotten since February or were living under a rock) and shares some new quotes from family and information on the case such as some of the prosecution's key witnesses. *"#Pistorians": Females Defending Pistorius On Twitter They also tweet pictures of him commenting on his looks. IOC Pres. Jauqes Rogge Defends Procedure For Picking New Olympic Sport And Says Wrestling Won't Be At A Disadvantage Because They're Not "New" "You don't go for a new one for the sake of a new one. Novelty is not the issue; quality is the issue." Kenya's Bernard Koech Runs Fastest-Ever Half Marathon (58:41) In US History At Rock 'N' Roll San Diego Half Meb Keflizighi was in the race as was Deena Kastor. Koech's first 10 miles were faster than anyone ever in America as his 44:47 is a new all-comers record - ahead of Haile G's 44:53. *Reuters On Koech - Koech's 58:41 Won't Count For Record Purposes Due To Elevation Drop But his 10 mile record WILL count. 39-Year-Old Claude Moshiywa Becomes 1st South African To Win "Up" Comrades Since 1992 The Nurgalieva twins went 1-2 as usual as Elena won her 8th title. Recap Of Australia's Most Difficult Race - Balmoral Burn - 420m Up A 14% Grade The 420m course up the steep street in the northern Sydney suburb rises approximately 60 metres in elevation at an average grade of 14%. Saturday: Lukas Verzbicas Runs 14:51 To Win 5,000 At Jim Bush Track Classic; Maggie Vessey Makes Season Debut With 2:03 800 Win Also at the meet was 2-time Olympic 400 hurdles champ Felix Sanchez, who was second in the 400 in 46.27 (Joey Hughes won in 45.84). Felix Kitur won the 800 in 1:45.87 as Charles Jock was 3rd 1:46.33. Kitur was also 2nd in the 1,500 (3:46) to Luis Gutierrez's 3:45. 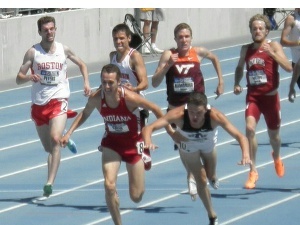 *Austin Tamagno Sets Freshman 1,600 National Record He ran 4:09.69. *Craig Miller Wins Festival Of Miles Mile In 3:59.23 As Top 3 Go Sub-4; Aaron Braun Was 6th In 4:01.43 USA Minnesota's Heather Kampf won the 800 in 2:01.96. Two days later, she won the Music City Distance Carnival 800 in 2:02.51. The mile there was won in 3:57.16 by Brooks' Matt Elliot as Olympic Trials steeple 4th placer Donnie Cowart (happiest 4th place finisher ever at the OT last year) was 4:01.36. Friday Night: Women's 800: LRC Phoebe Wright Gets The Win, Ajee Wilson's Winning Streak Comes To An End And Gabrielle Anderson PRs Wright ran 2:00.85 as Wilson was 3rd (2:01.24). 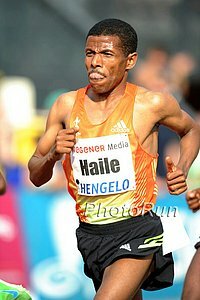 Friday Night: RRW/LRC Rabbits Falter, Kenenisa Bekele Outkicks Merga For 27:12 Win The 13:18 first 5k never materialized. In the end, Bekele was better than everyone else over the last 200 but he's got some work to do to scare Mo Farah. Men's International Mile: LRC James Magut Wins, No HS Sub-4 As Will Leer Gets Top American Honors, As Andrew Wheating Runs "Scared" It was a little windy and the times disappointed, but the post-race interviews with Leer, Wheating and Montoya certainly didn't as they were full of insight. *Pre:5000m, How fast was Soi's last 200m? *Will Mary Cain be the only American with every A-standard in the 800m, 1500m, and 5000m? *"You Wonder if the Virus is Taking a Little Out of Mo's Finish"
Friday Pre On The Boards: Farah overrules Salazar on Pre race selection Ken Goe of the Oregonian has the story here. UPDATE: Mo Farah Switches From 10k To 5k; David Rudisha Out Of 800 Bad news for distance fans as Farah has pulled out of Friday's 10k against Kenenisa Bekele (as was originally rumored here on Wednesday shortly after the annoucement for Bekele's request for pacing to a 13:18 first 5k) and will instead race the 5,000 against Galen Rupp and Bernard Lagat (still a good matchup). Rudisha has pulled out of the meet with a bone bruise. *Meet Director Tom Jordan: "It's just when you are going 26 laps against the world's best you want to be at the top of your game." Wow: Pregnant 44-Year-Old Woman Wins Mt. Everest Marathon She ran the high-altitude course in 6:02. Her husband and son tried to convince her not to do it. US News: Teg Does The Marathon? Good Read: Ben True Talks To RW About His Chances At Making The US Team For Moscow 2013 And Is Extremely Confident "I think I'm a top three guy any way you look at it. I'm very confident with my closing speed. At the end of the race, I think there are very few people who can run away from me ... I have the confidence to be able to run with everybody." Do You Live In One Of America's Fittest Cities? In national survey, Minneapolis-St. Paul said to be fittest urban area. 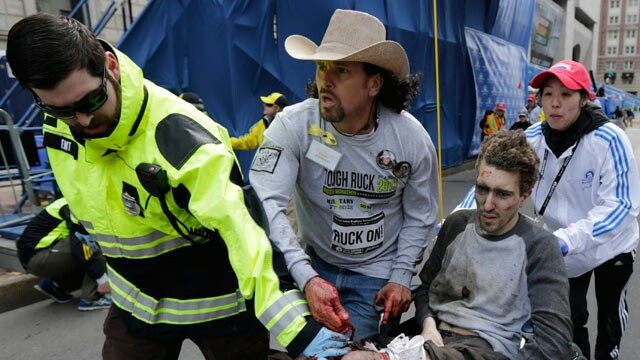 Boston Marathon Bombing Victim And His Rescuer Honored At Boston Red Sox Game They are the two from this well known photo after the blast. Two Ultra-Marathoners Running From DC To Boston To Raise Money For Boston Bombing Victims They have raised over $52,000 so far. LRC Men's 800 Even Rain Can't Stop David Rudisha; A Fall Robs Erik Sowinski Of Another Great Finish David Rudisha won as expected and Erik Sowsinki's good form continued as Robby Andrews still is searching for the breakthrough. *MB: Rudisha's SECRET revealed: time operates differently for him! LRC Men's 5k Hagos Gebrhiwet Establishes Himself As Mo Farah's Biggest Rival, Ben True Runs Well American Ben True's fine 2013 continued with a 4th place finish ahead of Dejen Gebremeskel. Dream Mile/100: DyeStat Dream Race Coverage: Ben Saarel Closes Last Lap In 56 To Win In 4:02.72; Edward Cheserek Was 3rd In 4:05.36, Andres Arroyo 8th (4:08.41) In the girl's dream mile, Wesley Frazier won in 4:39.17. Cameron Burrell won the boy's Dream 100 (10.40) and Ky Westbrook won the girl's race in 11.52. For Those Who Don't Think Genes Matter: HSer Cameron Burrell Wins adidas Dream 100 On The Same Track His Dad Leroy Set The WR At 9.91, Beating Carl Lewis In 1991 Burrell's father is a former WR holder and a 4 x 100 gold medalist from the 1992 Olympics. His mom also won a gold medal in the '92 Games running the heats of the 4 x 100. Yeah, good genetics matter. Maybe All Those Feel-Good Olympic Stories Aren't A Coincidence? 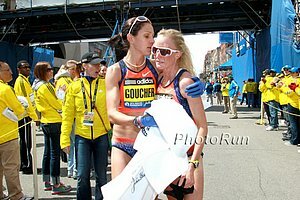 Study Finds That Past Adversity In Life Might Make You A Better/Tougher Runner Today The study found that being exposed to stresses in your life "toughens you up" and lets you better deal with pain while competing. Study Looks At How Exercise Affects Sleep, And Vice Versa They found that morning workouts result in fewer wakings during the night compared to afternoon or evening runs. LRC 2013 Shanghai Recap: Asbel Kiprop Pulls Off A Houdini Act, Do We Have A New King & Queen In The Men's Steeple And Women's 5,000? Asbel Kiprop amazed, a new phenom emerged in the men's steeple and perhaps as well in the women's 5,000 & Francine Niyonsaba dominated the women's 800. Plus lots of great sprint/field action with Kirani James, Shelly-Ann Fraser-Pryce, Jason Richardson, and Chinese hero, jumper Jinzhe Li. LRC Meet Preview: An Incredible Women's 1,500 Where Jenny Simpson Takes On The World's Best; Hagos Gebrhiwet Faces Mo Farah's Conqueror The women's 1,500 and men's 5,000 are spectacular. The winner of w1,500 is certainly the gold medal favorite, as 2011 world champ Jenny Simpson of the US (and Uceny) clash with Aregawi, Kipyegon and Dibaba. In the men's 5,000, 19-year-old world beater Hagos Gebrhiwet faces the man who beat Mo Farah in Eugene, as five of the six sub-12:50 guys from 2012 clash. Plus a men's 800 with Duane Solomon and Mohammed Aman and a women's steeple. *Justin Gatlin explains why he's been trash-talking Bolt- it's part of sport and needed for PR purposes -and sort of apologizes We still think Usain is going to spank him to teach him a lesson. *USATF Lists US Athletes Competing In Rome Today Also lists 2012 US Olympians competing at NCAAs. *Bolt: "I have four years left and will dominate them all." Bolt on Gatlin: "He's said a lot this season already, but for me it's normal because a lot of athletes always talk a lot. It's about when you show up and prove yourself to be the best at a championship. That's what matters." 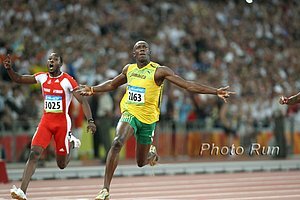 *Independent: Usain Bolt: The sprinter is back... and ready for the World Championships Bolt: "I have accomplished all my dreams but I do have goals that I make myself. I have four more years in this sport so now it is about dominating for those four years." *Bolt Talks Ahead Of Rome 100 And Comments On The Criticism He Received For Showing Up In A Picture With A Pro-Cannabis T-Shirt "They tried to make a big deal of it. I'm not going to really be stressed by that. I know who I am and I know what I've represented over the years." 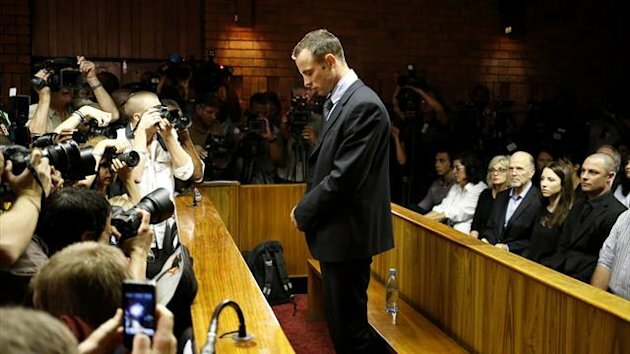 Oscar Pistorius' Hearing Postponed Until Aug. 19 (Includes Video Of Bodyguards Having To Force Their Way Through Huge Crowds To Get Pistorius To His Car) His actual trial is not expected to start before September, at the earliest. Adam Gemili loses to robot in a race but is conifdent he'll be better than ever in 2013 "My technique is much better, I am stronger and I have a lot more confidence." Creepy? Comrades Marathon Runner Grabs 5-Year-Old's Mickey Mouse Doll And Runs 50 Miles With It And Now Sleeps With It At Night The family wants it back and the marathoner says he's sad to give it up, but they can have it if they come get it from him. Study Finds Chronic Stress Not Good For Your Running (At Least If You're A Mouse, Anyway) Researchers found that mice under chronic stress did less running on the wheels in their cages than mice not under stress, but upped their mileage once the stress was removed. Aries Merritt: “2012 was a breakthrough year for me, I need to make sure I stay on top” He hasn't been having a good 2013, but hopefully he'll come around. *June 30: Deep 400H Field Set For Birmingham DL Meet With The Top 4 From London Games In Felix Sanchez, Michael Tinsley, Javier Culson & Dai Greene Aries Merritt headlines the 110H field. RRW Pre Recap: Tirunesh Dibaba Complained About The Pacemaking As The Pacemaker Dropped Out At 4 Laps When She Thought She Was Going 6 US's Alexi Pappas went 600m and Sara Vaughn took Dibaba through 1,600m in 4:37. Vaughn actually ran as fast as a pacemaker here as she did in her last mile race (a 4:38.93 for 8th place at Re:Run SanDiego). Her PR is only 4:34, so it was physically impossible for Vaughn to run that fast for 2 more laps. New Comrades Marathon Champion Claude Moshiywa Says That South Africans Need An Attitude Adjustment If They Want To Keep Winning The Famous Ultra Event The 39-year-old Moshiywa is extremely dedicated as he works full time for a bank and gets up at 3AM every day to run 20-32k before work. US 2004 Olympic LJ Champ Dwight Phillips Has Another Bad Meet With Last Place At Pre, But Says, "I will turn things around when I need to turn them around." If you're worried about him making Worlds, don't. He gets a bye as he's the 2011 champ. He says this is probably his last outdoor season though as he probably will retire after the 2014 indoor season. UK Sprinters In Switzerland: Olympic Semifinalist James Dasaolu Gets World Champs "A" With 10.14 (In The Semis) Dwain Chambers ran 10.31 for 2nd in the final. 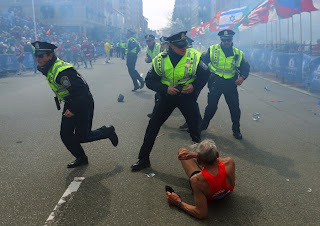 Update On Ultramarathoners Who Are Running From DC To Boston To Raise Money For Bombing Victims (Have Raised Over $65,000 So Far) They were in Connecticut on Friday. EA News: No Surprise That Czech 400 Hurdler Zuzana Hejnova Is Running Her Way To The Top She just dominated the field at Pre. Alysia Montaño Says She Was "Banged Up" Coming Into Pre And Thought Her Coach "Was Going A Little Crazy" Having Her Run "I felt my coach was a little crazy going into this; I've had a pretty hard last couple weeks." IAAF Full Meet Recap: Mutaz Essa Barshim cleared 7-10 1/2 HJ - the highest since 2000. LaShawn Merritt stunned Kirani James in 400. LRC Women's 800: Mary Cain Breaks 2:00 As Francine Niyonsaba Dominates Niysonaba was fantastic and got a new meet record. Also running amazingliy was American Brenda Martinez, but both were overshadowed by the 17-year-old Cain. LRC Men's 5,000: Mo Farah Is Beaten By Edwin Soi As Galen Rupp Finishes Sixth Dathan Ritzenhein ran the 2nd-fastest time of his career and Chris Derrick almost took top American-born honors but Galen Rupp's pride enabled him to mow them down in the last 100m. LRC Bowerman Mile: Silas Kiplagat Steals The Race From Asbel Kiprop At The Line As 10 Guys Run 3:51 Or Faster Matthew Centrowitz and Lopez Lomong both ran 3:51 but wanted more as it's never fun to finish 9th and 10th. LRC Men's Steeple: Conseslus Kipruto Survives Ezekiel Kemboi's Shove; Evan Jager 8:08 The men's steeple had everybody, including a mouth-watering dual between the future (Kipruto) and present rulers (Kemboi), that more than lived up to the hype. 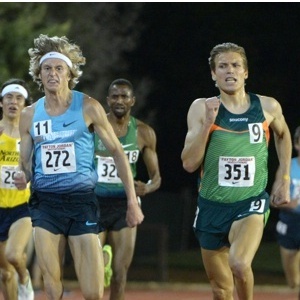 Evan Jager was right there until the last 250. LRC Women's 5,000: Tirunesh Dibaba Survives A Scare From Mercy Cherono Dibaba won but boy did she have to work for it on the thrilling last lap. Kim Conley PRed to grab top American honors. LRC Women's 1,500: Hellen Obiri Wins In 3:58 As Treniere Moser And Sheila Reid Run 4:02 Alberto Salazar's magic continued as the 31-year-old Moser crushed her 2006 PR. LRC Men's 800: Mohammed Aman Dominates As Nick Symmonds Debuts In Third An encouraging race for both Aman and Symmonds, who are dreaming of gold in Moscow. Pistorius's Family "Shaken" By Images No need to worry about jury pool being tainted as the judges decide things. Dwain Chambers - Bolt's Biggest Rival Is Bolt Himself "I think the biggest threat to Bolt is Bolt himself, that's the only thing that might let him down..The only thing stopping him is if he wants it enough. I believe he does." Frisbee On The Road To Being An Olympic Sport? AK Names "Probable" List For 2013 World Championships There will be the usual debates/issues with Kenyan pre-championship camps as they want all their athletes there on June 2nd, but most are racing/training around the globe and that will never happen, but they will get angry about it anyway. Kip Keino Re-Elected As President Of Kenya's Olympic Committee (NOCK) Despite Facing Criticism Over 2012 Olympic Performance Paul Tergat was also re-elected to his position as athletes' representative. Athletics Kenya President Isaiah Kiplagat Was Crushed In The Election For NOCK Vice President By Kenya Swimming Federation Chairman He was pretty angry and said, "This is all tribal ... They are also afraid of me because I question everything and they have never wanted me there in the first case." Kenyan Opinion Piece: Why NOCK Team Were Bound To Retain Seats "Intrigues, backstabbing, horse trading and a whiff of blackmail are some of the highlights of the high stakes National Olympic Committee of Kenya polls." Caster Semenya Might Not Race This Season As She's Not At 100% Fitness After Coming Back From A Knee Injury Her Coach Maria Mutola says contrary to the SASCOC statement (which said her funding was cut because she wasn't training) Mutola says she has been training, but says they are "a little bit behind." Japanese Marathoner Kaori Yoshida (4th Place In December's Honolulu Marathon) Gets 1-Year Doping Ban For Testing Positive For EPO She only got a 1-year ban because she supposedly took it by accident after receiving medication from a doctor for anemia. IAAF Profile On Canadian Multieventers Damian Warner And Brianne Theisen Who Won Last Saturday At The Hypo Meet In Gotzis Theisen got the upset win last week in a field that included Russia's reigning world champion Tatyana Chernova. Wrestling, Baseball/Softball And Squash Shortlisted By IOC For Inclusion Into The 2020 Olympics A final decision will be made in a full membership vote in September. Karate, roller sports, sport climbing, wakeboarding and the Chinese martial art of wushu were eliminated yesterday. Dutch Track For The Fanny Blankers-Koen (FBK) Games Could Be No More As Officials Are Planning On Tearing Up The Stadium's Track And Turning It Into A Soccer Pitch This meet/stadium has been host to some historical track performances, including 4 world records by Haile Gebrselassie (at 5k, 2 miles and twice in the 10k) and Kenenisa Bekele's current 5K WR from 2004 (12.37.35). Sign The Petition To Save FBK Stadium In Hengelo Dutch article here and here. LRC Non-Distance Action: Blanka Vlasic Returns With A Win, Tyson Gay Wins Again As Does Jenn Suhr, Favorites Christian Taylor And Brittney Reese Struggle Amantle Montsho somehow went sub-50 in terrible conditions. LRC Women's 1,500: Aregawi Wins Easily As Expected; The Americans Miss The "A" As Morgan Uceny Improves Step in the right direction for Uceny and Rowbury. *How Good Does Leroy Burrell's Son Get? 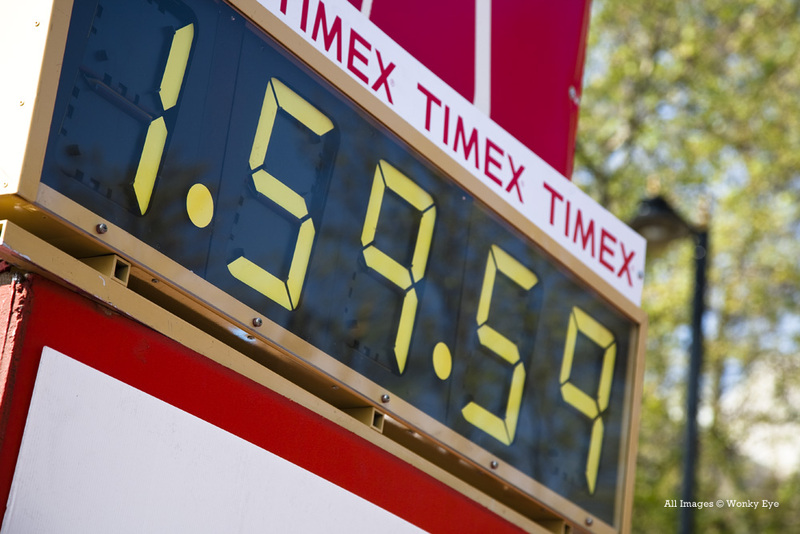 *The LetsRun.com Guarantee - No Sub-4 mile on Saturday. If there is a sub-4, we'll pay you $1,000. 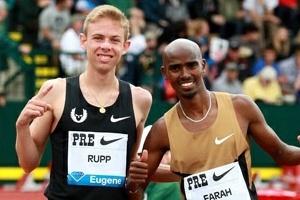 *IAAF Recap: "Mo Farah Upstaged By US Prodigy Mary Cain"
MARY CAIN 4:04.62 IAAF A STANDARD!! *OXY HP Live Thread *Nick Symmonds wins OxyHP *Ritz looked great tonight *Bottom line: How many "A" Standard did Oxy Accomplish? *Prediction Of Day: Mary Cain will run under 4:06 tonight *Webb at oxy... Very concerning... I love the guy but what's happening to his career?! Study Shows That Kenyans Do Benefit From Taking EPO Even Though They Have Different Blood Profiles From Living Their Whole Life At Altitude This would seem to hurt the theory shared by renowned marathon coach Renato Canova on the LetsRun message boards; namely that Kenyan runners don't receive a performance boost from EPO. 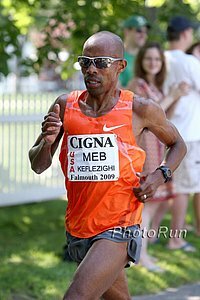 For All You Cigarette Smoking Runners Out There: Study Finds Exercise Curbs Nicotine Cravings Random factoid: Multiple-time Boston Marathon champ Bill Rodgers smoked back in the 1970s and noticed that running decreased his urges to smoke. Friday we had Matt Tegankamp talking about his marathon debut as our QOD. However, we linked to the wrong article. We apologize for the error and you can see his quote with correct link on yesterday's homepage. Mixed Messages From Caster Semenya And Her Coach: "I'm back in training. I just need a couple of weeks to qualify. It's my dream to win my title back. That is what I'm planning with the coach." Meanwhile, her coach Maria Mutola said, "We might have to call off the season ... We have to consider if she can run good times." Haile Gebrselassie Says Now That He's Over 40 He Doesn't Do Speedwork Anymore As It Makes Him Too Tired He's excited about breaking masters records, saying, "Every race after this, it's possible to break a masters record because the times are not superfast." St. Kitts And Nevis Top Sprinter Tameka Williams Gets 3-Year Drug Ban Williams was pulled from her Olympic team last year after admitting to substance use. LRC Mark Wetmore Is Going To Be A Very Happy Man: Ben Saarel Is A Special Talent LetsRun.com co-founder Robert Johnson goes all out in his praise of Saarel, who closed in 55 to win the boys HS mile in NY in 4:02, as despite that speed, he's a 5k/10k guy. Unreal. Can you say sub-13:00 for 5,000 down the road?